Eastside Women of Purpose (EWOP) is part of a larger Women of Purpose group with participants around the country. The world relief organization, World Concern, will be facilitating this great opportunity to hear stories from people working in the countries that WE have been trying to help. They will also be asking for donations but there is NO obligation. Read below for how to register for one or both of these great events! We are excited to offer you two opportunities to hear inspiring, heart-touching stories from the front lines of World Concern’s ministry. On Saturday, February 20th you can come to a scrumptious tea and hear Tracy Stover, our Chad Country Director, speak about what it’s like to bring help and hope to families who have fled the tragic crisis in the Darfur region of Sudan and Eastern Chad. Then, on Saturday, February 27th you can cozy up to cups of coffee while Richard Johannessen and Ana Maria Clamor from our Asia Office in Bangkok share about fighting human trafficking in Southeast Asia. You won’t want to miss these opportunities to hear what inspiring people are doing to make a difference, and how you can help them take hope farther. For more details, click here to download a complete copy of the invitation. Advance registrations are required, as space is limited. 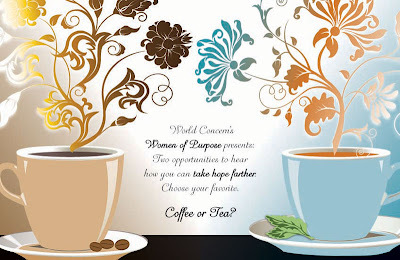 You can register online at http://donate.worldconcern.org//page.redir?target=http%3a%2f%2fwww.worldconcern.org%2fcoffee&srcid=21231&srctid=1&erid=580287 or http://donate.worldconcern.org//page.redir?target=http%3a%2f%2fwww.worldconcern.org%2ftea&srcid=21231&srctid=1&erid=580287, or call (206) 546-7396 by February 10th (for the tea) or February 17th (for the coffee). We hope to see you in February.